If you use iWork applications (Pages, Numbers, Keynote), you can use the iWork section of iCloud to sync your documents across all of your devices—Mac OS X and iOS. Sort of. While it generally works well when syncing documents among iOS devices, syncing to and from Macs is another story. Even when syncing among iOS devices, there is potential danger—including a chance that all of your documents will vanish. Let’s start with the Mac. To move an iWork document from your Mac to iCloud, you (1) log in to iCloud in a Web browser and go to the iWork section, (2) click the name of the specific iWork app you want to access and (3) drag the icon of the desired document from the Finder to the iWork app’s webpage (see iCloud: Syncing for more details). That’s correct. There is no automatic syncing between Macs and iCloud. If you later edit the document on your Mac, your changes are not automatically updated to the copy on iCloud. Instead, you have to repeat the just-described procedure. Assuming the name of the file is unchanged, you will be asked if you want to replace the existing iCloud file. However, if you have made changes to the iCloud version in between these uploads, those changes will be lost when you replace the file. This is all in contrast to how software such as Dropbox works. Here, you drag an item to the Dropbox folder on your Mac and it syncs everywhere that Dropbox goes. Subsequent changes on any device sync to all devices. Clean. Simple. Why doesn’t iCloud work this way? I see no good reason why Apple couldn’t have an iCloud folder on your Mac that works similarly to the Dropbox concept. In fact, it would be in keeping with Apple’s push toward “sandboxing” of program documents. Even so, there remains a critical reason why automatic syncing between Macs, iCloud, and iOS devices would be difficult, if not impossible, to pull off right now: The Mac and iOS versions of the same iWork document are different. When you load a Mac version of an iWork document into an iOS iWork app, the document is converted to the iOS format. Mainly, this means that the iOS app strips out features of the document that iOS does not support. If the iOS version automatically synced back to the Mac, replacing the Mac version, you would lose all the Mac-only features of the document. Speaking of syncing back to the Mac, while there is no automatic syncing, you can manually select to download an iWork file from the iCloud website. The file winds up in the Downloads folder on your Mac. If the file was originally created on your Mac, the downloaded version will be missing any Mac-only features. It is essentially a Mac-compatible copy of the iOS version of the file. Note: Immediately after uploading a file from the Mac to iCloud, you cannot turn around and download it; you first have to open it in an iOS iWork app, so that it is converted to the iOS format. It would seem that the only sure way for Apple to avoid these sync issues would be for the iOS and Mac versions of iWork apps to support the exact same features and document format. I don’t see this happening anytime soon. Now let’s move on to iCloud and iOS devices. The good news here is that iWork documents moved from the Mac to iCloud, as well as iWork documents created on iOS devices and synced to iCloud, will sync perfectly among all your iOS devices. At least they should. If you find that this is not happening, try turning off—and then back on—Documents & Data in Settings -> iCloud on each iOS device. If that doesn’t work, as a last resort, delete your iCloud account from your iOS devices and re-add the account to each device. See this Apple Support thread for more details. On final potential and serious danger: According to several threads in Apple Support Communities, such as this one, there is chance that documents synced via iCloud may get deleted from your iOS devices and iCloud. This can happen, for example, simply by powering down an iOS device and turning it back on. Although this did not happen to me when I tried to replicate the symptom (and I can’t say I was disappointed), it has been confirmed by numerous postings to the Apple Support threads. While no one has reported a sure way to prevent the deletions or why some are victim to the bug and others are not, there are several suggested solutions for retrieving the missing documents. 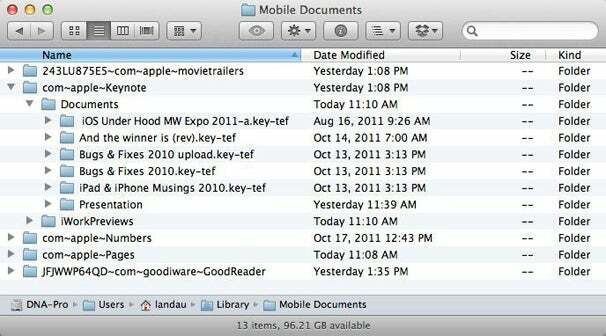 One retrieval method involves going to the Mobile Documents.delete folder in the home directory Library of your Mac. To get to the Library folder (which is invisible in Lion), hold down the Option key when accessing the Go menu in the Finder; the Library item will appear. Select it. Once inside—and assuming you’ve enabled iCloud for iWork documents—you should at least see a folder called Mobile Documents. Within this folder will be copies of all of your iWork documents currently available in iCloud. You may also see a Mobile Documents.delete folder. If so, this is where you’ll find the documents that have disappeared. To get your documents back in iCloud, follow the detailed instructions given in this posting. For another possible solution, involving extracting the missing documents from an iOS backup file, check out this appleiphoneschool.com page. Surprise! 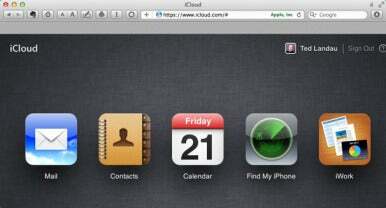 It turns out that there is automatic syncing between Macs and iCloud after all! It happens in the Mobile Documents folder. However, this is not a folder that Apple intends for end-user access. So be careful when meddling here. It is of limited value in any case. You may note that documents in this folder appear as folders, not actual documents. To convert one of these folders to an iWork document, remove the “-tef” from the extension in its name. Do this with a copy, moved elsewhere, not the original. Even if you do this, the document will not open in the Mac versions of iWork documents. It remains in an iOS-only format.